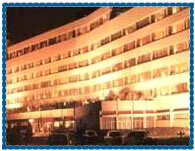 Hotel Grand Ashok Bangalore, Grand Ashok Hotel Bangalore, Reservation for Hotel Grand Ashok, Bangalore, India. Address: Kumara Krupa, High Grounds, Bangalore- 560 001, India. Accessibility: 13 kms. from Bangalore Airport, 3 kms. from Railway Station, 3 kms. from Bus Stand. Hotel Ashok is located over 10 spacious acres in the High Grounds area of Bangalore, overlooking the green expanse of the adjoining golf course, close to the bustling business and shopping districts of the city. It is a 5 star luxury hotel offering all of the amenities, facilities and levels of comfort and is suitable for business and leisure travelers alike. Hotel offers 179 guest rooms including twins rooms, double executive rooms, Luxury suites, double suites and presidential suites. 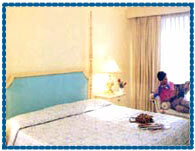 All the rooms are well equipped with all the modern amenities to give comfort to its guests. Beauty Parlor, Health Club, In-house Video Programming, Swimming Pool and Tennis Court, Well-equipped Business Center Conference Facilities, Internet Facility, Secretrarial services, Doctor, Laundry, Money Changer, Safe Deposit, Baby Sitting, Valet , Travel Desk, Shopping Arcade.